We need to talk about the future of zoos. There are about 1,500 formal and many more informal ones in the world, holding between three and four million undomesticated, non-human creatures displayed for our curiosity and amusement. It’s fair to ask: To what end? What is the conservation value to the species of those confined in zoos, and are the conditions under which they are held conducive to their physical and psychological wellbeing? At great cost to themselves, we’re asking zoo animals to be wild ambassadors and live in captivity. If they’re cared for, well fed, safe and able to socially interact in extensive enclosures — are happy — and their presence serves to support the survival of their wild cousins, their confinement may be justifiable. If these outcomes are not in place, and they seldom are, zoos are simply money-making freak shows. They certainly have a chequered history. Originally, zoos were created as private royal menageries in Egypt, Assyria and China, but in the Roman Empire they became holding pens for brutal public spectacle. The historian William Lecky records that at one time [in the Roman Games], bear and a bull, chained together, rolled in fierce combat across the sand. Four hundred bears were killed in a single day under Caligula. Under Nero, 400 tigers fought with bulls and elephants. In the 16th and 17th centuries, explorers captured and brought home for their benefactors the exotic animals they encountered. Many died on the way, but those that survived were placed in menageries, often in the gardens of palaces. The first zoo as we know it was the London Zoo founded in 1828. It initially practised science behind closed doors but eventually opened to entertain paying guests. Since then zoos have spread across the globe. Most use cages with bars to keep the animals inside and on display. They’re actually a tangible link to a colonial past and reminders of the conquest of distant lands. Which brings me to Lammie, the lonely elephant at the Johannesburg Zoo. There’s a photograph of her precariously reaching across a deep moat to an outside world she has never known for the 39 years of her life. Once, touching that freedom, she fell into the moat but, miraculously, was uninjured but for a broken tusk. She’s the last of her known family and lonely, living at the zoo in a treeless enclosure with minimal water under the unremitting gaze of human visitors. In 2018 her only companion, Kinkel, died of colic and eating sand. Lammie spends most of her day against the wall of her enclosure, the only shady place, where she stands doing almost nothing, a sign of boredom and probably depression. Humane Society International-Africa, the EMS Foundation, Ban Animal Trading and the Elephant Reintegration Trust have joined forces to try to persuade the zoo to move her to a rewilding sanctuary. They offered to pay for the translocation. The zoo’s response was that Lammie couldn’t be moved “as she was born at the zoo and has lived her whole life in this environment”. She was also there to “educate the less privileged to understand our natural environment”. The four NGOs pointed out that a single elephant standing doing nothing had no educational value and, furthermore, there was no adequate environmental enrichment for Lammie or decent shade in the enclosure. A study the organisations undertook found that few people spend more than three minutes at her enclosure. There is also no information about the plight of elephants, which are being poached in Africa at the rate of one every 15 minutes, or about elephant behaviour. Zoo marketing manager Jenny Moodley agreed that more signage and educational input was needed, but said there was unfortunately only one education officer. In a letter to the zoo, the NGOs noted that “there are numerous examples of ex-captive elephants being successfully reintegrated into the wild. Therefore, the argument that Lammie is required to be kept captive because she is zoo-born is extremely weak”. Moodley pointed out, however, that when an elephant named Thandora was relocated from Bloemfontein Zoo to Gondwana Game Reserve she died, so moving Lammie could pose a danger. Gondwana owner Mark Rutherford agreed that relocation of single elephants can be tricky and needed careful management — Thandora probably died from eating something which poisoned her. But he said that by first pairing elephants and then releasing them, relocation was perfectly possible. Moodley said the zoo was about to acquire another elephant (contradicting previous statements that no decision had been taken) and expand the enclosure, but the NSPCA has opposed this and threatened legal action. The reason, it says, is that the zoo’s captive environment is detrimental to any elephant’s well-being. It also resigned from the zoo’s Animal Ethics Committee. According to an NSPCA statement, “[we] informed the zoo that if they are to move to obtain another elephant, the society would launch an application in the high court to interdict the action”. “It would be completely irresponsible of the Johannesburg Zoo to continue to deprive elephants of a good life,” said Karen Trendler, the NSPCA’s trade and trafficking portfolio manager. “Experts have said that captive elephants should be kept in social groups of no less than four elephants — something the Johannesburg Zoo is not equipped for. Lammie’s situation highlights the need for a wider discussion about zoos and the wild animals confined within them. Non-human animals have been found to display a range of emotions, among them fear, sadness, happiness, playfulness and curiosity. They’re sentient in the fullest meaning of the word. At a time when scientists know more than ever about the inner lives of animals and when concerns about animal rights loom large, many experts think that zoos need a major overhaul if they are to survive. There are zoos that do important scientific and conservation work, but most (particularly in Asia) do not. Very often even the science done is about animals in captivity. Zoos are also good at manipulating language to legitimise their existence: captivity becomes “preservation” and entertainment becomes “education”. Writing in the New York Times, environmental journalist Justin Worland asked the obvious question: given new insights into how animals may suffer from anxiety and depression when they’re removed from nature, should they be held in captivity? According to Barbara King — a US biological anthropologist who wrote the book How Animals Grieve — “the vast amount of breeding that goes on in accredited zoos is to keep animals in the zoos. In other words, we’re breeding gorillas so there are more gorillas in zoos and so forth. So it’s very much of a self-perpetuating cycle”. She said it was time to start thinking about tipping the ratio towards sanctuaries. If longevity is a yardstick, zoos are not good for elephants — in captivity, their lifespan is far shorter than their normal 70 years in the wild. More than half of the 76 elephants which have died at Association of Zoos and Aquariums-accredited facilities in the US since 2000 never even reached the age of 40. A report published in The Seattle Times by Michael Berens on the fate of elephants in American zoos shows that infant mortality for elephants in zoos is almost three times the rate in the wild. He found that for every surviving elephant born in a zoo, on average another two die. “Zoos are a part of the money-driven animal-industrial complex…the animals are often used as breeding machines, like dogs in puppy mills. And thousands of healthy animals are ‘zoothanised’ each year [because of over-breeding]. A counter-argument is that, if it wasn’t for zoos, most people wouldn’t even know that these animals exist. Could you mobilise preservation efforts for something people don’t even know about? One answer is informative television; an even better idea suggested by US zoo designer Jon Coe would be virtual reality immersion without real-time contact. Whatever the level of visitor engagement, zoos are not about to disappear because of animal rights concerns. So if they’re going to be around, there needs to be public pressure to change their modus operandi. A yardstick could be a “first do no harm” principle, ensuring that compassion and individual welfare are at the heart of zoo construction and animal keeping. We need to ask about the cost to the animals themselves. And how can we use human curiosity to kick-start empathy and conservation of wild creatures and places? How can the animals teach visitors to be better planetary citizens? A “do no harm” principle, however, puts elephants beyond the capability of zoos, something that zoo management is increasingly acknowledging. Since 2000, 37 zoos in Europe have closed their elephant exhibits, including London Zoo in Regent’s Park, because they could not provide appropriate facilities for such large, far-roaming, intelligent animals. According to Audrey Delsink of Humane Society International-Africa, these zoos acknowledge that, as a species, elephants fare very poorly in zoo exhibits, which cannot meet their social and physiological needs. Excluding elephants, she says, “is exemplary and the ethical, correct and responsible approach”. 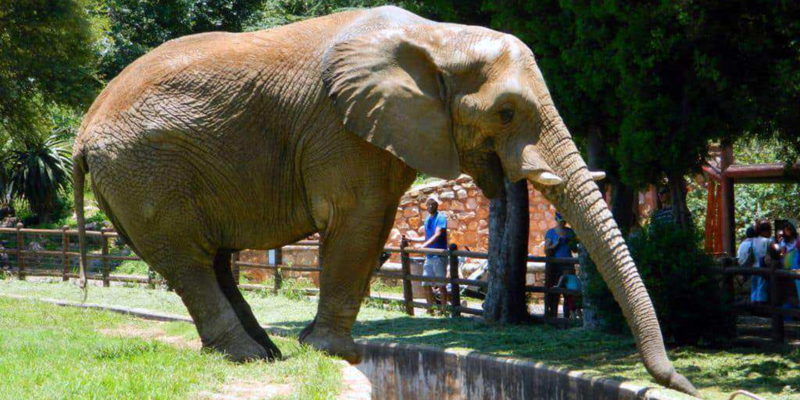 Meanwhile, the future of Lammie, Johannesburg Zoo’s lonely elephant, hangs in the balance. She has lost both her parents, all her siblings, a calf (which died) and her partner. Her present behaviour displays all the marks of deep sadness. She’s a social animal deprived of a society. Neither the zoo nor her presence there provides any insight into the intricate lives, intelligence, communication abilities, emotions or calf-caring abilities of elephants. It carries no conservation message. She’s there simply because, in outdated thinking, what’s a zoo without an elephant? On Saturday, 9 February 2019 Ban Animal Trading will hold a Free Lammie protest, starting at 11am on the corner of Jan Smuts Avenue and Upper Park Drive in Johannesburg.